OutOxford will host a Code Pink, LGBTQ-friendly event this Halloween at Proud Larry’s called “The Babadook Ball” featuring a drag performance. OutOxford is a nonprofit organization that connects the active LGBTQ community with the university and the town of Oxford. OutOxford works through community service and hosts events geared toward Oxford’s queer community while also creating safe spaces for those who identify as LGBTQ. Founded in 2017, it has hosted many Code Pink events this semester. For those who aren’t familiar with the meme, the Babadook-inspired party may seem a bit strange, but the Babadook humorously became the face of the gay community over the past year. 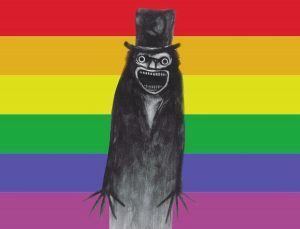 It’s not uncommon to see the Babadook’s face on a poster at pride parades and other LGBTQ events. Code Pink is an LBGTQ dance night in Oxford and is hosted in various places around town to allow gay communities and straight communities to unite in a night full of dancing, music and performances. Code Pink is an affiliate of the Sarah Isom Center for Women and Gender studies, and OutOxford also works to produce these Code Pink events. Campus support from the Isom Center and other campus organizations helped establish OutOxford as an organization. Oxford doesn’t have any specific gay bars, so Code Pink events allow the gay community to have an exciting night and meet others within the community in a safe and fun atmosphere. “Proud Larry’s and the other places we’ve hosted Code Pink events have been awesome. They’re always incredibly supportive, and they acknowledge the importance of having these fun and safe spaces for our community,” Summers said. The Babadook Ball is open to anyone 18 and up, and it costs $5 to attend. It offers a safe space for everyone to celebrate Halloween and diversity with an exciting night on the Square. The doors open at 9 p.m. at Proud Larry’s, so be sure to wear your best costume and be ready to get “babashook.” All proceeds will go toward OutOxford and will go back into helping the entire community through the organizaion’s community service projects.